Quenching is a term used in metal heat treatment as the process of rapidly cooling a heated metal using a fluid as the cooling medium. The quenching fluid can be either water, brine, oil or air or inert gases. Air Quenching is simply the type of quenching in which a stream of air is directed over the workpiece to cool it down from above its critical temperature. Quenching is a crucial part of the process of hardening in metals. The hardening process in steel and its related alloys is done to convert the Pearlite grain structure which is soft and not good for practical uses, into a much harder form known as Martensite. Quenching is achieved by heating the metal above its critical temperature or Eutectoid point, holding it for a time and then rapidly cooling it below the critical temperature. This is done to allow smaller grain size to develop leading to hardening of the material. 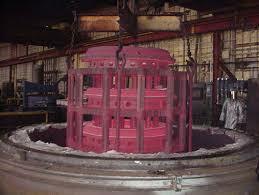 Other heat treatment processes are Annealing, Air Hardening etc. The fluid used to quench the workpiece depends on the required rate of cooling for that particular alloy. 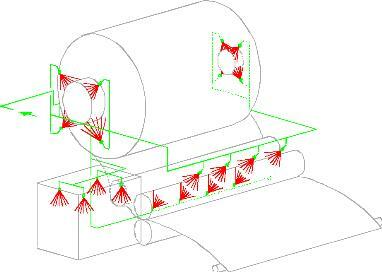 The rate is determined by the composition and the size of the workpiece. For example, low carbon alloys usually require rapid quenching while alloys with large amounts of Manganese. Nickel or other alloying elements may require slower quenching. Air Quenching is employed when slower and uniform cooling is required in the workpiece such as high alloy steels. Still, air or compressed air can be used to cool the workpiece though care must be taken that cooling is uniform to prevent cracking or deformation. The air stream must also be free of moisture. Non Ferrous materials are usually quenched in liquid but very large workpieces may be cooled using Air quenching.